Earlier this year, during a visit to Munich, I walked into this little watch shop near the city center and I was amazed by the collection they had. Tried on an AP ROO Diver and decided that could become my next watch, or at least earned a spot in my want-list. I am talking Meertz World of Time in Munich here. A cool watch store with a lot of vintage Rolex , Jaeger-LeCoultre Atmos clocks and a lot of other brands. 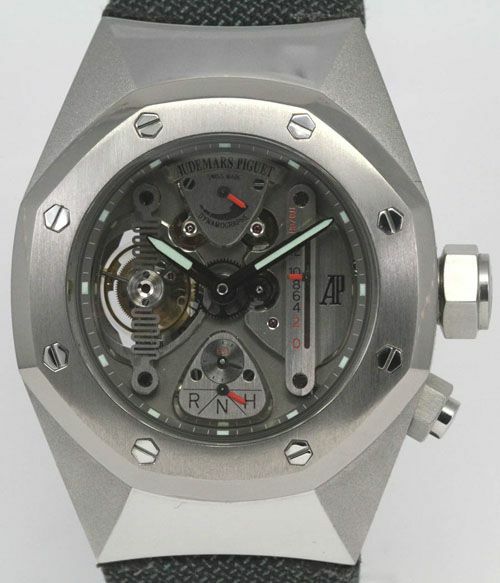 Today, I noticed that Meertz has this cool Royal Oak Concept 1 watch by Audemars Piguet up for sale. It dates back to 2004 and was limited to 150 pieces only. Introduced in 2002 (there was a special catalogue for this model and also AP’s famous #1, #2 and #3 catalogues mentioned this model), celebrating 30 years of Royal Oak watches, Audemars Piguet created this extreme looking time piece that was made out of an alloy called Alacrite 602 and featured a titanium bezel. The caliber 2896 manual wind movement was created by Renaud & Papi (which belongs to AP) and featured a clutch for the crown functionality, displaying whether the watch is in winding, setting or neutral mode. Something we’ve recently seen on other timepieces as well. Furthermore, this watch features a power reserve indicator (70 hours), a tourbillon (which doesn’t make that much sense on an extreme sports watch) and a Dymograph. A what? Yes, a Dymographe. It is an instantaneous mainspring torque indicator, which means just that. You have to know that a watch with a spring (as mechanical watches tend to have) has no constant force (= torque) but diminishes as the spring unwinds. The Dymographe shows just that, the mainspring’s torque at that particular moment. 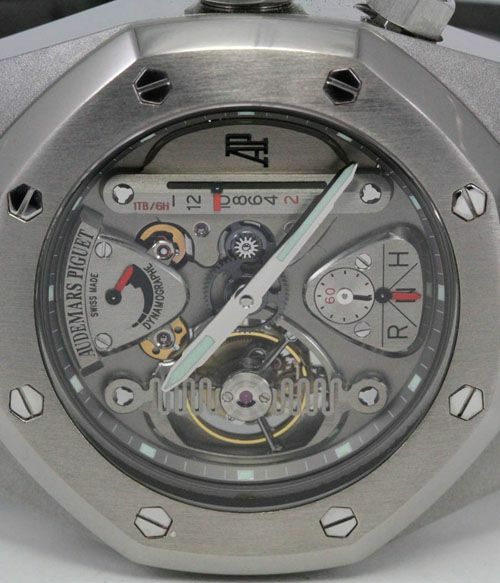 A similar Royal Oak Concept ref.25980AI has been auctioned by Antiquorum in 2007, and fetched $232,400.- USD. Today’s price of this watch at Meertz World of Time is 178.500,- Euro (approx $261,300.- USD). The 150 pieces AP created were divided over 2002 (30 pieces), 2003 (60 pieces) and 2004 (60 pieces). Click here for Meertz World of Time’s offer for more details and photos!